Fandom-related posts are always unlocked, and comments are always most welcome. Everything else is f-locked. I friend--and fiend (heh)--easily but don't imagine that everyone who wants to see Spaiku and doll!fic posts necessarily longs to read the day-to-day flailings of a harried, married, middle-aged woman. If you do, well, bless your heart. I'm happy to wave you aboard! Please leave a (screened) comment to be added. Ghost in the machine exorcised. Geezalou, you lose a little time and LJ gets all pouty and unravels your links list. Fixed now! Thank you and you and you! Thanks to the sweet person who gave me a snowflake cookie for my profile! I've been waaaay out of the loop for the past four weeks caring for an injured parent on top of the usual working mama craziness, and this little pretty was much appreciated. Many thanks also to louise39 for a lovely holiday card. It was the first card I received this season,and it's holding a place of honor on the mantel. And finally, a big ol' (shamefully belated) muchas gracias to ladyaelfwynn for the generous gift of the book Vampire Haiku. Heeee! I've found both the historical and seasonal aspects of the haiku highly diverting. Thanks so much for sending me some giggles. They were most welcome! Once the semester ends and I get this cranky old guy out of my house, I hope to come back and play. 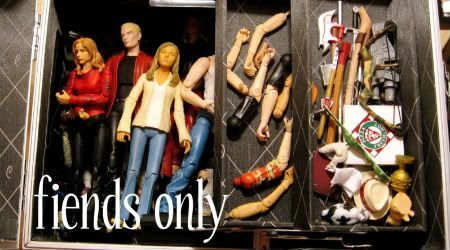 And finish my darned Seasonal Spuffy doll!fic. It looks so sad, lying in its file all neglected and uncaptioned. Also? I miss y'all liek whoa. ::huggles flist:: Hope all is well and that the season is being good to you and yours. Triple birthday spectacular, with treachery. Today is the birthday of three lovely LJ ladies: the sassy, Seraph-ic snickfic; fangirl, writer, and incredibly generous commenter brunettepet; and finally, mistress of both the FITB fic and the naughty, naughty limerick, the rabble-rousing rebcake. How could I let such a momentous convergence pass without a little commemorative doll!fic? *narrows eyes* How indeed? Well, I'll tell you exactly how. By putting my trust in a bunch of lazy plastic losers who have forgotten their craft! *wrings hands* Honest to Pete, you try to be a good employer and give some people (vampires--whatever!) a little downtime, and suddenly they can’t be bothered to do things like show up on a set ready to work! *wrings tiny necks* Everybody’s got excuses and obligations! And opinions! Anyway, I don’t know what to do with them. It grieves me to present such an incomplete offering, but let me at least show you what I’ve got so you can see what I’m up against. While I was running the last leg of my own family's September Birthday Gauntlet, I stumbled and missed powerofthebook's special day. Hope you had a good one, dear! Belated birthday greetings to Missus Grace! Sadly, I was out of pocket on Monday and gracelessly missed missus_grace's birthday. Here's a little late something for a gal who wouldn't think twice about her course of action if confronted with Spike and some kind of edible topping.